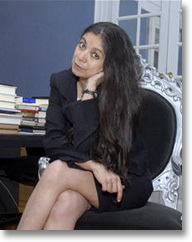 Carmen Boullosa is a leading Mexican poet, novelist and playwright. Her work is eclectic and difficult to categorize, but it generally focuses on the issues of feminism and gender roles within a Latin American context. She has won a number of awards for her works, and has taught at universities such as Georgetown University, Columbia University and New York University (NYU), as well as at universities in nearly a dozen other countries. She is currently Distinguished Lecturer at the City College of New York and is now married to Mike Wallace, the Pulitzer-prize winning co-author of Gotham: A History of New York City to 1898. Boullosa has written over a dozen novels, and some of these works have been translated into five different languages. Her bestselling novel, Son vacas, somos puercos (1991) was translated into English in 1997 as They're Cows, We're Pigs. The story is narrated in the first person by an old man looking back on his life. He was kidnapped and sent from his native France on a slave ship to the West Indies at the age of thirteen. To gain his freedom, he joins a group of pirates (or "pigs"), allowing Boullosa to compare two very different societal and political systems—traditional Europe and carefree pirates. In La milagrosa, a novel written in 1993, the protagonist is a girl who has the power to heal the sick and perform other miracles while she sleeps. She falls in love with Aurelio Jimenez, a detective sent to discredit her, even though she fears that her powers will disappear if she spends time with people. It ends ambiguously, leaving an unsolved murder without closure. Duerme, another popular work published in 1995, tells the story of Claire, a French woman whose mother was a prostitute. Attempting to escape the same profession, she arrives in Spain dressed as a man. To save a subject of the Spanish king, she reveals herself as a female and prepares to take his punishment of death by hanging. Beforehand, however, she is wounded in the left breast and her blood is replaced by water from the lakes of Mexico City. The water's magical powers make it possible for her to survive the punishment. She is also famous for her Teatro herético (1987), a compilation of three parodies in play format—Aura y las once mil vírgenes, Cocinar hombres, and Propusieron a María. The first tells the story of a man called by God to "deflower" eleven thousand virgins in his life, so that heaven's overpopulation problem might be addressed, since the women will have to wait in purgatory for a time. The man then uses his sexual encounters as material for his television commercials and becomes a successful advertising agent. Cocinar hombres tells the story of two girls who find themselves to have become young adult witches overnight, so as to fly over the earth tempting but not satisfying men. Finally, the third play satirically recounts the conversation between Joseph and Mary before Mary gives birth to Jesus and ascends to heaven.